It has been said that a picture is worth a thousand words. Sometimes that thousand words knit together to tell the story of a family. 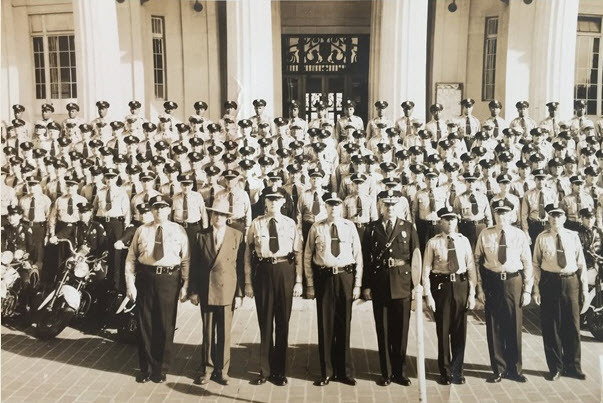 Beth Fox shared a panoramic photo of the 1950 police department posed in front of the historic Dade County Courthouse. The photo represented the start of a career for her father, Ken Fox. The photo captures the pageantry and pride of those who served in the city police department in mid-century Miami. The photo also tells the story of a family that established roots in Miami following service during World War II. Beth Fox’s maternal grandparents moved from Saint Augustine to Miami in 1922. Her grandfather, Henry Lee Harper, came to Saint Augustine to work on Henry Flagler’s FEC railroad. He brought his family down to Miami in 1922 and moved into a house on Hibiscus Street in Coconut Grove. Henry Lee got involved with building homes in the Charles and Elizabeth Street areas. The homes were very distinctive in that they featured very bright colors for the time. Some of the homes built by Henry Lee on Charles Street remained many years later. There may still be one or two that remain standing today. Beth’s mother, Elizabeth, and her siblings grew up in Coconut Grove. Beth still has her aunt’s graduation ring from Ponce De Leon High when it was a high school. The school has been a middle school for many years. Although Ken Fox was born in Springfield, Illinois in 1925, when it was time to serve his country during World War II, he was deployed to the Richmond Naval Air Base in South Dade County. Richmond Naval Air base was the home of a fleet of blimps responsible for finding German Submarines off the South East coast. Ken’s job was a blimp mechanic and worked within one of the three hangars used to maintain the anti-submarine blimps. Beth’s mom, Elizabeth Harper, was living with her two older sisters just on the outskirts of downtown Miami at 610 SW Thirteenth Avenue in what is now part Little Havana. The three women had civilian jobs at Richmond Naval Air base and would take the bus from Miami to South Dade County for work. It was at the Naval Air Base that Ken and Elizabeth met. One of Elizabeth’s sisters met and married a British RAF pilot in Miami. The pilot’s name was Leeland Evans and, unfortunately, he was shot down and killed two years after their marriage. After Ken Fox’s assignment in Miami was over in 1945, he was sent to Connecticut. He sent for Elizabeth and the two married shortly after her arrival. Like so many others who served in Miami during World War II, the Fox’s returned to Miami shortly after getting married. The newlyweds moved back to Coconut Grove and settled near the area we now know as Merrie Christmas Park. Ken worked a couple of jobs including time as a bus driver. However, he discovered his true calling in 1948. Ken Fox joined the Miami Police Department in 1948. He appears as a young officer in the 1950 panoramic photo that he saved and pass along to his daughter. Ken served in a number of different roles within the Miami police department during his 29 year career on the force. One of his roles was lieutenant at the Overtown Precinct in the early 1960s. His job was to prepare the annual budget for the station. He was thoroughly disappointed with the conditions the black officers had to endure. The locks on the jails were broken, the roof leaked, the water fountains didn’t work, the toilets didn’t flush and there were pot holes in the parking lot. Ken Fox believed that all officers that carried the badge should be treated the same and given the same resources to do the job. Quietly, he began to document all of the problems with the station. He had a photographer, from the identification unit, take pictures all of the deficiencies. Fox gathered estimates to fix the problems and submitted the photos, along with a budget, to City Hall to provide an idea of the condition of the station and what needed to be done to address the issues. Rather than fixing all of the deficiencies, the city decided to close the station in July of 1963. The Director of Public Safety, Colonel D.D. Pomerleau, explained the closing of the station in a Miami Herald article as necessary to “increase efficiency and eliminate duplication of physical properties and assignments”. The closing of the Overtown precinct led to integration of the Miami Police. However, it was most likely Ken Fox’s research that acted as a catalyst to force integration of the police precincts. Although officers began working together in the same building, work assignments were still divided by racial lines. The same Miami Herald article made it clear that black officers will still patrol the black areas of town. Fortunately, almost 40 years after the closing of the Overtown precinct and courthouse, the building was still standing. On September 17th, 2002, the preservation board approved historic designation of the former precinct. The building is now the home of the Black Police Precinct and Courthouse Museum. Much like her father, Beth Fox decided police work was her calling as well. Beth graduated from the police academy in 1994 and served on the Miami-Dade Police Department until she retired in 2005. Following retirement, like so many other long time Miamians, Beth decided that the changes in Miami was no longer for her. She chose to move up Central Florida in 2005. Recently, as part of another move, she rediscovered the photo her father left her so many years before. The photo reminded her of how her family came together in Miami during a time of service to the country. It also reminded her of family service to the Miami community as law enforcement. A community that her entire family always appreciated and will remember fondly. Assuming the museum decides to accept the photograph, the Miami Police Department in 1950 photo will be donated to the History Miami museum research center in the near future. Hopefully, the photo will provide the opportunity for another Miamian to identify a family member that served along with Ken Fox and the others standing so proudly in front of the Dade County Courthouse in 1950. Oral History: Family history provided by Retired Miami Police Officer Beth Fox. 5 Comments on "Miami Police Department in 1950"
Nice article .. enjoyed it very much. 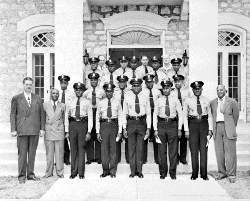 I believe the c. 1952 photo of Miami’s Black police officers was taken in front of Halissee Hall. Thank you, Rick. I knew that the building looked familiar. I compared the 1952 photo with a picture of Halissee Hall and it was definitely taken in front of Halissee Hall. Thanks again! So nobody could do some basic Fact Checking? Naval Air Station Richmond was the Navy Blimp Base. 1941: The U.S. Navy purchased 2,107 acres to construct a blimp base. Construction begins on April 20th 1942. September 15th 1942: Naval Air Station Richmond is commissioned. 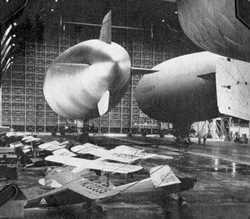 The following month October 14th, 1942 the first LTA airship (Blimp) landed at NAS Richmond and Airship Squadron 21 was formed. July 18th, 1943 Navy Blimp K-74 is shot down by German Submarine U-134, the only blimp lost in combat. September 15th 1945: Hurricane and Fire destroy the three large wooden Hangars of NAS Richmond. Richmond Air Force Station was built after World War II and was at one time shared by the Air Force and the Army and was the command center for five (5) Nike Missile Batteries located thought South Dade County, one of which has been restored in the Everglades. 1959 to 1992: Richmond Air Force Station, site of 644th RADAR Squadron. From 1962 until 1979, was shared with the Army for the Nike Missile air-defense system as Army site HM-01DC. The FAA operated on the site until August 1992. If you can’t get some simple facts correct, how much of the rest of the story in wrong too? Cully, thank you for catching the wrong description of naval air base. You are correct that the story took place at the Richmond Naval Air Base. The story has been corrected. This was the year Jimmy Sullivan was indicted and Thomas Kelly took over as Sheriff.